How often do you get to say “I helped save a few hundred lives today? … By donating to SNYP you do! For SNYP 1+1 doesn’t equal 2. 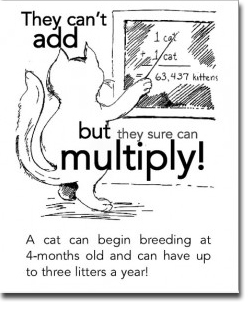 It equals countless litters if we don’t get to them in time. When you donate to SNYP you’re not only helping one animal, you’re saving countless lives the most humane way – through prevention. If you are considering a year-end donation for tax purposes, please consider donating to SNYP today – on GIVING TUESDAY. celebrate generosity worldwide. Following Thanksgiving and the widely recognized shopping events Black Friday and Cyber Monday, this year’s #GivingTuesday will take place on November 27th and will kick off the giving season by inspiring people to collaborate and give back.